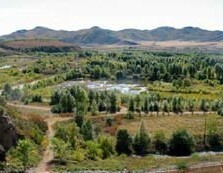 Wulanchabu has vast picturesque grasslands which are the nearest grasslands resorts to Beijing. Huitengxile Grassland (huī téng xī lè cǎo yuán 辉腾希勒草原) is a beautiful alpine meadow with many natural lakes scattered throughout the grassland. The largest wind power plant in Asia also stands in the grassland. 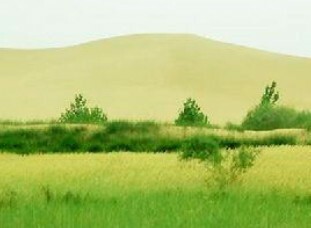 Gegentala Grassland (gě gēn tǎ lā cǎo yuán 葛根塔拉草原) is an AAAA national level tourist destination boasting a typical grassland landscape. Among the lakes, Daihai Lake (dài hǎi 岱海) is like a shining pearl inlaid in Wulanchabu, and is the third largest freshwater lake in Inner Mongolia. There are many relics and ruins of fossils, villages and ancient towns, as well as parts of the ancient Great Wall and tombs around the lake. It is only four hours' drive from Beijing and an hour from Datong (dà tong 大同) in Shanxi (shān xī 山西). Wulanchabu City is both easy to get to and to leave due to its accessibility to several surrounding airports which are all connected by expressways. The seat of the city's government, Jining District (jí níng qū 集宁区), is about 150 kilometers (93 miles) or about one and a half hours from Hohhot Baita Airport (bái tǎ jī chǎng 白塔机场), 300 kilometers (186 miles) or three hours from Baotou Airport, and 360 kilometers (224 miles) or four hours from Beijing Capital International Airport. Additionally, Datong Airport is 120 kilometers (75 miles) from the city and Taiyuan Wusu Airport (tài yuán wǔ sù jī chǎng 太原武宿机场) can be reached in about five hours. There are also five railway lines that pass through Wualnchabu City. Erenhot (èr lián hào tè 二连浩特), Baotou, and Tongliao in Inner Mongolia, Junggur Basin (zhǔn gé ěr pén dì 准噶尔盆地) in Xinjiang (xīn jiāng 新疆) and Beijing can all be reached from Wulanchabu by train. In addition, the Dandong-Lhasa Expressway, the Erenhot-Hekou (hé kǒu 河口) (Yunnan Province) (yún nán shěng 云南省) and the Hohhot-Hailaer Expressway all run through the city. It takes approximately four hours to drive there from the international inland port of Erenhot, which is an important stop on the passage to Outer Mongolia. The railway station in the city proper operates international lines to Ulan Bator and Moscow. The central bus station of Wulanchabu City is situated on Huaiyuan Road (huái yuǎn lù 怀远路). Xing'an League is rich in tourist resources. Forest landscape of the Daxing'anling Mountains (dà xīng ān lǐng 大兴安岭) and Qarsan National Forest Park (chá ěr sēn guó jiā sēn lín gōng yuán 察尔森国家森林公园), strong flavor of Mongol ethnic minority in Horqin Grassland (kē ěr qìn cǎo yuán 科尔沁草原) and Genghis Khan Temple (chéng jí sī hán miào 成吉思汗庙) show best the natural and historical beauty of Xing'an League. Chaershen National Forest Park is located in the territory of Xing'an League Division front flag, 32 kilometers away from the Wulanhaote City. Is a beautiful forest and grassland in one, trees lush, green grass and every year to attract large numbers of tourists both within and outside of the resort guests. Horqin Nature Reserve, located in Section rare flag right in the east, 40 kilometers east to west, 45 kilometers long from north to south, with a total area of 120,000 hectares in 1995, was approved by the State Council for the National Nature Reserve. State protected areas to protect rare birds and a class of white stork, black zygom. Originally built in 1940, the Genghis Khan Temple is located on the top of Mountain Hanshan in Wulanhot City. The Temple integrates the architectural styles of three ethnics, namely Mongolia, Han and Tibet, and adopts the axial symmetry layout in conventional use by the ancient Han people. 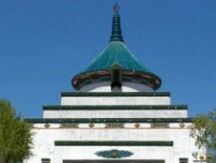 The main body of the temple has a round top and a square body, with green cap and white walls, and is featured by typical Mongolian and Tibetan architectures. Facing the south, Genghis Khan Temple is square in the lower and round in the upper, with the whole temple palace in the shape of the Chinese character “山": the 28 meters high main palace in the center, and 16.62 meters high side palaces in the east and west, totaling nine steeples. Inlaid with green colored glaze, the round ceiling of the main palace hangs a blue, rectangle stele, reading “Genghis Khan Temple” (in both Mongolian and Chinese). The temple covers an area of 822 square meters. The main palace has 16 great red-lacquered columns with the diameter of 0.68m, and on the pedestal at the center of the main hall is seated a whole-length cast copper statue of Genghis Khan, which is 2.8 meters in height and 2.6 tons in weight, with the display of weapons of Yuan Dynasty in both sides. The western and eastern side palaces display clothes, books and vessels of the Yuan Dynasty. In addition, ceilings of all the three halls are painted with ancient drawings of Mongolia, with walls of the hall and corridor painted with Genghis Khan’s mottos and drawings. A’ershan (or Arxan) (ā ěr shān 阿尔山) is a city with perfect mountain and water tourist resorts. Aershan Volcano and Warm Spring National Geopark has hot mineral springs of healing qualities. Tianchi Lake (tiān chí 天池) in the geopark is a crater lake formed by a volcano and ranks in the top six heavenly lakes in China. In winter, the Aershan Skiing Resort is an excellent destination. There are two national forest parks in Aershan - Haosengou National Forest Park (hǎo sēn gōu guó jiā sēn lín gōng yuán 好森沟国家森林公园) and A’ershan National Forest Park. A’ershan National Forest Park (ā ěr shān guó jiā sēn lín gōng yuán 阿尔山国家森林公园) is a 100,000+ hectare nature reserve in northeastern Inner Mongolia famous for its volcanic landscapes, mountaintop lakes, deep forests, grasslands, rivers, and mineral-rich springs. Wulanhot (wū lán hào tè 乌兰浩特) Airport is 17 kilometers (11 miles) northwest of the city proper, with direct flights to Beijing and Hohhot. Baicheng (bái chéng 白城) (in Jilin) to Aershan and Tongliao (tōng liáo 通辽) to Huolin River (huò lín hé 霍林河) railways pass through Xing'an League. National Highways No.111 and 302 run through the league from the south to the north. In the seat of the league government, Wulanhot City, the bus station can be found in Xinqiao East Street (xīn qiáo dōng jiē 新桥东街). Wuhai is in the west of Inner Mongolia, along the upper reach of the Yellow River, neighboring Ningxia Hui Autonomous Region. As an industrial city, Wuhai has various natural resources, among which the coal mine is the richest. The city is also one of the most important grape bases in China. For tourism, Wuhai is famous for its Yellow River and desert scenery. The city also boasts of its calligraphic works, many of which have been released in national newspapers and television stations. In addition, 24 ethnic minority groups add to the charm of the city. Folk culture such as Gao Qiao (gāo qiāo 高跷) (walking on stilts), camel racing and playing on the Matou Qin (mǎ tóu qín 马头琴) (a musical instrument) appeal to tourists. Rock Paintings on Mt. Zhuozi (zhuō zǐ shān yán huà 桌子山岩画): Created in the Neolithic Age, the rock paintings reflect the religious culture of the northern hunt and herd nationalities of ancient China. Qixiagu Grand Valley: More than 650 meters (710 yard) long, the valley is lined with strange peaks on both sides, leaving just a little space which is called ‘A line of Sky' by the locals. Diversifolious Poplar Islet: Set in the center of the Yellow River, it is made of five smaller islets, among which one is covered with diversifolious poplar. West Ordos National Nature Reserve (xī è ěr duō sī guó jiā jí zì rán bǎo hù qū 西鄂尔多斯国家级自然保护区): Thousands of rare or ancient plants are preserved in this area, among which Tetraena mongolica Maxim (sì hé mù 四合木) and Half-day flower (bàn rì huā 半日花) are the most precious. It is the peculiar plant in Alxa desert area and is under the second-class protection of the state. Other Tourism Spots: Jinshawan Ecological Tourism Resort (jīn shā wān shēng tài lǚ yóu qū 金沙湾生态旅游区), Mabaodian Ecological Tourism Resort (马堡店生态旅游区), Yellow River Holiday Resort (huáng hé dù jià cūn 黄河度假村), Dayu Wharf, Ancient City Site of the Han Dynasty (hàn cháo 汉朝) (206 BC-220), Beacon Tower of the Ming Dynasty (míng cháo 明朝) (1368-1644). Wuhai Airport is located 14 kms (9 miles) north of Haibowan District. It has flights to Beijing, Hohhot, Lanzhou, Xi'an, Shanghai, Shenzhen and other important cities. Baolan Railway (bǎo lán tiě lù 包兰铁路) (Baotou- Lanzhou) traverses the city and extends to Tianjin, Beijing, Datong, Yinchuan and many other northwest cities. Wuhai West Railway Station is located in Wuda District (wū dá qū 乌达区). Situated in the east part of Inner Mongolian Autonomous Region, Tongliao City is bordered by Jilin (jí lín 吉林) and Liaoning (liáo níng 辽宁) provinces in the east and the south. It neighbors Chifeng (chì fēng 赤峰) City in the west, situated at the convergence of Northeast China and North China. Zhurihe Grassland Tour Zone (zhū rì hé lǚ yóu qū 珠日河草原旅游区): Like a gem inlaid in the hinterland of the Keerqin Grassland, Zhurihe Grassland Tour Zone is a comprehensive attraction combining magnificent pastoral view and the Mongolian folklore with strong local flavor. The Keerqin Grassland Horse Race Festival is held there annually. Location: 101 km away from Tongliao city. Fuyuan Temple (fú yuán sì 福源寺): Located in Kulun Town of Kulun Banner (kù lún qí 库伦旗), it is a Lama temple combining with Lamaism school built in 1742, and its name was christened by Emperor Qianlong of the Qing Dynasty (1644-1911). Grand summons ceremonies will be held every quarter of a year. The reserve is situated in the territory of Horqin Left Wing Rear Banner (kē ěr qìn zuǒ yì hòu qí 科尔沁左翼后旗), and Shenyang is 190 kilometers to the southeast, Horqin City is 100 kilometers to the north and Ganqika Town, the place where the government of the banner is located, is 25 kilometers to the east. It is a well-preserved ancient geological site. Daqinggou is 10 kilometers in length, 200-300 meters in width and about 100 meters in depth. There is boundless water outside of the gorge and many mountains, beautiful woods and tall trees there. The uniqueness of Daqinggou lies in its diversity. The geomorphological sights include forests, grasslands, deserts, lakes and rivers. There are over 700 plants in Daqinggou. In the spring, the flowers are beautiful; in summer, green shade covers the whole area; in autumn, the maple leaves are like fire and in winter, it is misty. Stepping into Daqinggou in summer will rid you of the summer heat. In the freezing winter, Daqinggou is as warm as it is in the spring. Tourist activities: viewing the primitive forest, exploration, roaming the desert, lake fishing, horse-riding and playing and a grassland campfire song and dance performance. Holidaymaking village, Luzhou Hotel, Telecom Resort, the Fuding Hotel consisting of Mongolian tents offers luxury and comfort boarding and distinctive Mongolian catering for the visitors. Traffic: take the train to or pass by Tongliao and get off at Ganqika Town, then walk 10-15 minutes to the long-distance bus station and take a special bus (hourly) heading for Daqinggou, you'll get there after one and a half's drive. The Tongliao-Shenyang Highway is adjacent to Daqinggou, visitors can take a bus there. It is located in Naiman Banner, 150 km from Tongliao City. It is 1200 square meters has been built one room floor to accommodate 200 guests in a restaurant, at the end of 2005, total construction funds into more than 300 tourist million tourists totaled 150,000 passengers, more than 500 million in tourism revenue. 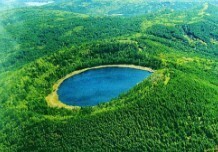 Transportation: Travelers can take the bus from Tongliao city to Molimiao Reservoir. Quiet Lake Resort is located in Huolinguole City (huò lín guō lè sì 霍林郭勒市), 4 km north of Man Shan city. It covers an area of 2 acres. It’s a really good place to have fun there. And thanks to the fine weather condition, visitors can enjoy a cool summer there. And in winter, you can state on the snow and enjoy carving sceneries. The pagoda is situated in Naiman Banner of Tongliao city. It was built in Qing Dynasty. And it’s in the list of culture relics of Inner Mongolia Autonomous Region. Tongliao's long-distance bus station is seated in Xinjian Dajie (xīn jiàn dà jiē 新建大街), Keerqin District. Generally, visitors can reach Tongliao in 4 hours from Jilin and 5 hours from Shenyang. The way from downtown Tongliao to the Keerqin Grassland will cost two hours. Tourist buses in the city proper will help visitor to the Fuyuan Temple. Tongliao Airport is 7 kilometers (4.3 miles) southwest of the downtown area. Airport buses are available. Otherwise, the airport dispatches four flights a week to Beijing and one flight every day to Hohhot. Bayannur City is situated in the western region of Inner Mongolia Autonomous Region, neighboring Outer Mongolia to the north. Within Inner Mongolia, it borders the steel city of Baotou on the grasslands to the east, the coal capital, Wuhai, to the west and to the south it is separated from Ordos by the Yellow River. Bayannur is Mongolian for rich lake. This ancient and fascinating land gave birth to twenty-nine ethnic minorities who lived there harmoniously and created a brilliant civilization combining farming with nomadism. For the natural scenery, Wuliangsuhai Lake (wū liáng sù hǎi 乌梁素海) is a wetland ecological tourist zone and a perfect bird habitat. Alaben Grassland, Ulashan (Wulashan) (wū lā shān 乌拉山) National Forest Parkand Viction International Golf Resort are perfect destinations to experience the beauty of Bayannur. Desert landscape represented by the Sanshenggong Water Control Projecton (sān shèng gōng shuǐ lì shū niǔ 三盛公水利枢纽) the Yellow River and Ulan Buh (Wulanbuhe) (wū lán bù hé 乌兰布和) Desert is another enchanting aspect of Bayannur. Additionally, visitors can get to the boundary area with Mongolia to experience the strong Mongolian flavor. Baotou-Lanzhou Railway runs through Bayannur. But apart from this, much longer journeys should be taken by bus. From the long-distance bus station in Shengli Nan Lu of the downtown area, buses travel to Hohhot (hū hé hào tè 呼和浩特), Baotou (bāo tóu 包头), Tianjin (tiān jīn 天津), Beijing (běi jīng 北京) and Xi’an (xī ān 西安).